Bring rhizocali Tempeh to your restaurant, catering, or group. Are your customers requesting vegan and vegetarian options? Do they appreciate locally produced and fermented foods? At rhizocali Tempeh, we know that no matter the buzz, menu additions must be consistently delicious, affordable, and fit into kitchen production. Our tempeh is priced to become a staple, intrinsically flavorful but adaptable to your current cooking routines, and ranked the best tasting meat substitute by vegans and omnivores alike. 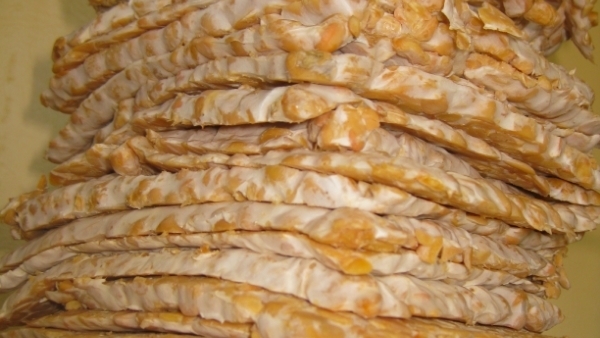 rhizocali Tempeh provides quality local tempeh to Bay Area restaurants and caterers. We can bring you samples and discuss ideas for how our tempeh can be an asset to your menu. Is your kitchen unfamiliar with cooking tempeh? We can help with that! Tempeh can be prepared in most of they ways you already serve common proteins like meat or tofu. We can show you ways to integrate tempeh seamlessly into your prep and cooking routines. Call us at (510) 842-5583 or email rhizocali@gmail.com to place an order for your restaurant, catering business, or store, or to schedule a complimentary consultation.